What makes modern windows so incredibly energy efficient? A major contributor to the appeal of today’s latest glass technology is an innovation known as low emissivity. A surface with low thermal emissivity emits a very low level of radiant thermal energy, or as we common folk call it: heat. Heat can be found on the electromagnetic spectrum just below visible red light. Commonly referred to as infrared or IR for short, radiant heat has a longer wavelength than visible light does, and so low-e technology takes advantage of this fact at the microscopic level by using various layers of coating that are engineered to allow wavelengths in the range of visible light pass through, while strategically blocking both infrared radiant heat as well as ultraviolet light, or UV rays as they’re commonly known. Since the coatings only block certain wavelengths of the spectrum (the non-visible wavelengths) they are called spectrally selective coatings. Visual clarity of modern low-e glass has been achieved by continually reducing the thickness of the spectrally selective coating down to around only 250 nanometers. A human hair is about 200 times thicker. Modern low-e glass manufacturers have optimized the manufacturing process, applying the microscopic layers using special coating machinery inside a vacuum chamber, reducing the thickness to eliminate the dark mirror-finish seen on earlier generations of low-e window glass. This optimizes thermal efficiency while the glass remains transparent. Low-e technology has made it possible to have more energy efficient glass windows and doors available to the consumer. Upgrading your home or business with new frameless sliding glass doors and windows with a spectrally selective low-e coating, as opposed to traditional clear glazing, saves substantially on heating and cooling bills since summer rays stay out and warmth from the winter heater remains trapped within. Low-e beats traditional clear glazing by a long shot when it comes to exerting control over your interior climate. The conventional practice of clear glazing window glass lets ultraviolet light through which fades and damages carpet, hardwoods, and upholstery, and allows for excessive heat transfer, increasing the burden put on your air conditioner during hot days and your home’s heating system when it’s cold. Energy efficiency has become a major concern for governments both at the federal and state level. The state of California has issued rules and regulations - known as Title 24 - that establish energy efficiency standards for windows, roofs, lighting and HVAC. 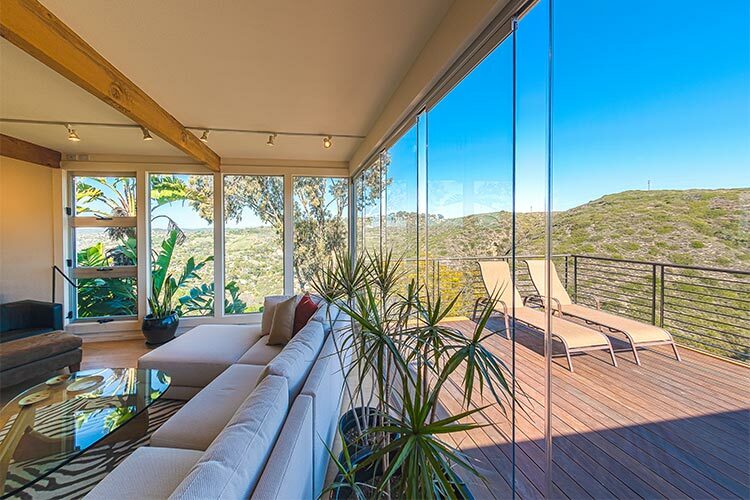 Rising energy costs and an increasingly unpredictable climate make the decision to upgrade to low-emissivity frameless sliding glass doors and windows ever wiser. 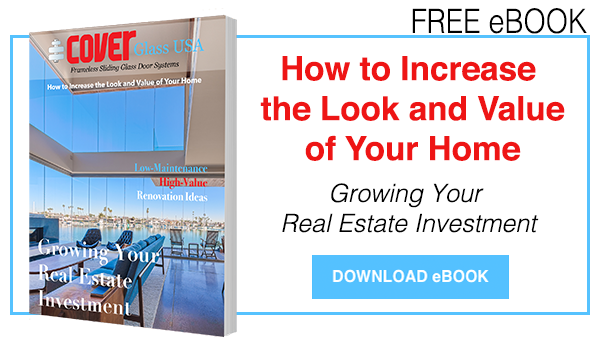 The savings ultimately recouped from the initial expense mean that upgrading your home with the latest glass technology is a smart investment.